Mechanism design is not as straightforward as market design, with the 3 clear factors. It’s easier to share the types of mechanism designs as well as the various projects that use them. 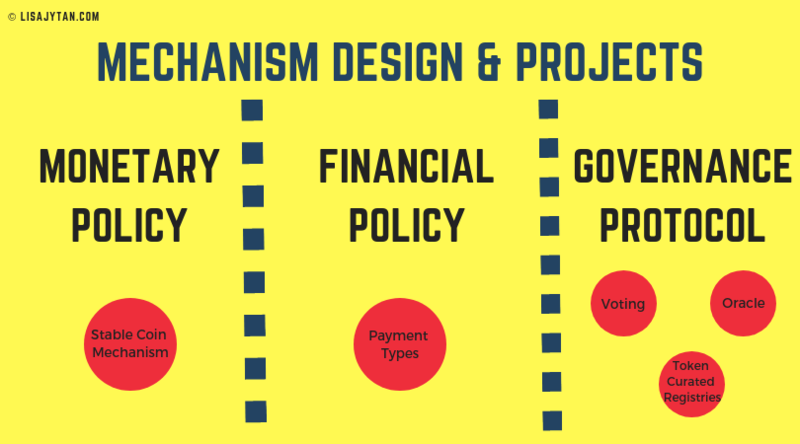 This case study approach is easier to analyse which mechanism is better for your project. First, the types of mechanism designs according to the 3 large categories (monetary policy, financial policy, governance protocols). Second, human-explanations for the types of mechanism design. Third, deep dive into each of the mechanisms with more details/types and link to a crypto-project using that mechanism. As always, sources and additional links will be at the bottom. Disclaimer: not investment advice. Purely for research, academic & education purpose. 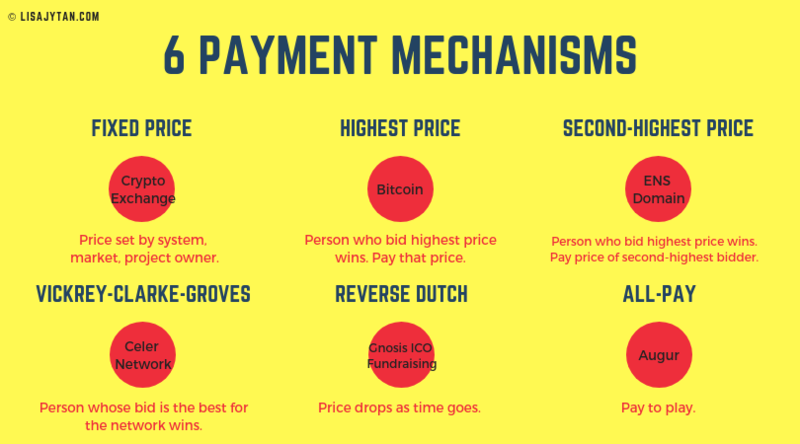 Auctions/Payments: Instead of a centralised system setting the payment price, you (the buyer) set your own price and compete with other buyers to receive the object. Voting: Instead of a centralised system making decisions and changes, you (the token holder) can vote on issues and take ownership of the changes. Oracles: Instead of a centralised entity giving input/answers to the system, you (the network participant) can add information into the oracle to be evaluated. Note: not all projects need this. And some projects call it another name. Token curated registries: Instead of having a centralised entity like Buzzfeed to rank “best cheesecake in Philly”, you (the voter) can curate the decentralised list. This is only relevant for stable coin projects. 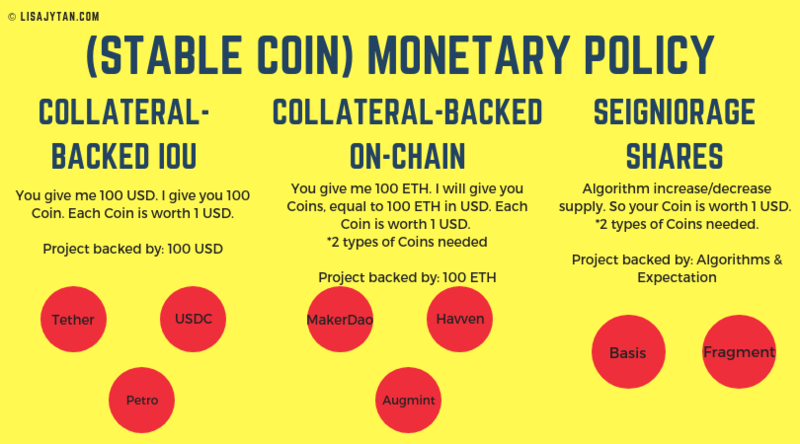 Collateral-backed IOU: Project takes 100 USD from you. In return, they will give you 100 of their tokens, worth 100 USD to spend within the system. Note: It can also include precious metals like gold, or commodities like oil, to back the currency. Note 2: This what how our money system started anyway. Having gold reserve to back the value of our currency. Collateral-backed on-chain: Instead of taking 100 USD from you, I will take 100 ETH to back the currency on the system. This currency will maintain a 1:1 peg to something, e.g. USD. Seigniorage Shares: Algorithms expand or contract the supply of currency like central banks. The only thing that is keeping it valuable is the future expectation that the currency will reach certain value. Note: This behaves like how central banks work right now. Why countries buy USD bonds even when US economy is in a huge debt? Because they believe and expect that the value of USD will increase in the long-run. Just like how seigniorage shares work. Payment can come in various forms: payment of ICO fund-raising, payment to validate your information on the blockchain, payment to use services on the DApp, payment to purchase services on the DApp. Fixed price: Price set by the system/project creator. Take it or leave it. Projects: Prices of tokens on crypto-exchanges. Highest bidder/price: The person who bids the highest amount will be accepted. In late 2017, lots of projects want to be validated and added to the blockchain. Users had to offer higher transaction fees, so miners will validate their blocks. The higher you offer, the more likely your block will be accepted and validated. Second highest price: The highest bidder will get the item. But instead of paying the price he bid, he will pay the second highest price instead. Note: This type of auction proves that in paying the second highest price, the bidders will bid the true value. Vickrey-Clarke-Groves auction: The person whose bid maximises the total social good of the network is chosen. Note: this format incentivises bidder to bid their true value. Reverse dutch auction: Price drops as time goes. This was a one-time thing, when Gnosis was raising funds. It is the only project that used this method. Don’t focus on this mechanism, unless it really adds value to the system. It should not be just a marketing tool to ride that hype-wave. All-pay: Everyone who participates have to pay. They are a betting platform. You place your bet on the event, and you can bet how much you want. You only join the bet when you pay. Voting is one of the most important aspects of the governance side in Mechanism Design. There are many inefficiencies and flaws in the voting systems we use today, and maybe with blockchain, we can reduce these inefficiencies in our new system. Read my longer post for on-chain voting. (On-chain) Commit-reveal: Imagine you shout out your choice to everyone in the network. Then you reveal that choice, and everyone can verify if it is what you committed to. 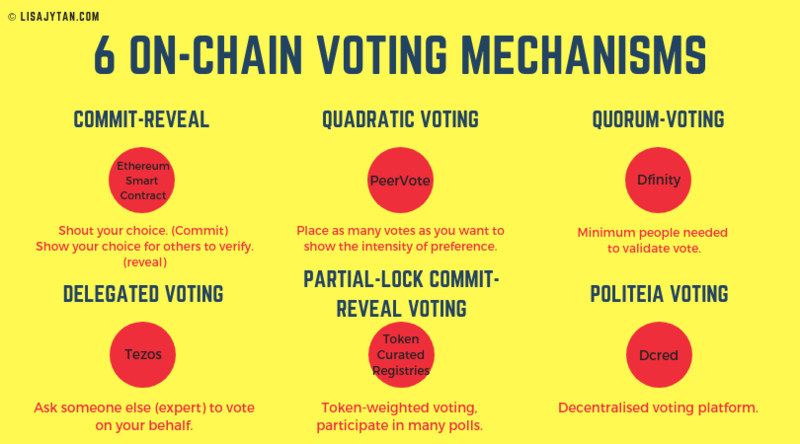 (On/off-chain) Quadratic Voting: Instead of 1 person 1 vote, you can now place as many votes as you want on the issue. It shows the intensity of your preference. The cost of the votes are related to the number of votes you cast. The cost of influence is in the units of votes. Under this model, the solution is always an efficient solution. The more people in the system, the more efficient the outcome. 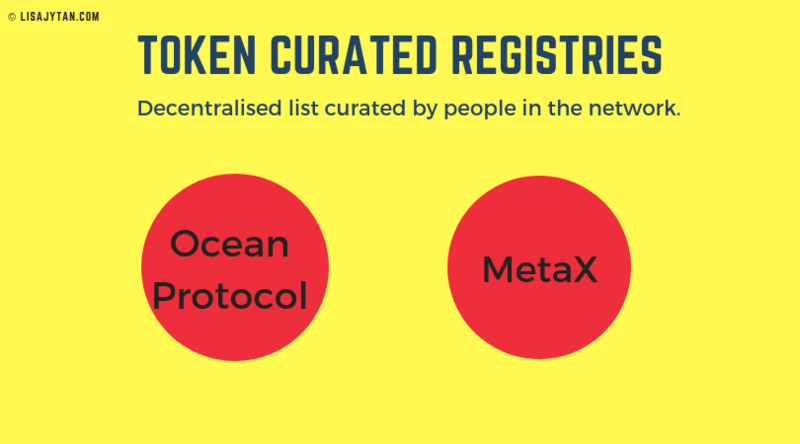 Used by Token Curated Registries: Decentralised list curated by people in the network. There is an economic incentive to curate the list’s content. Voting in this platform uses token-weighted and commit-reveal mechanism. 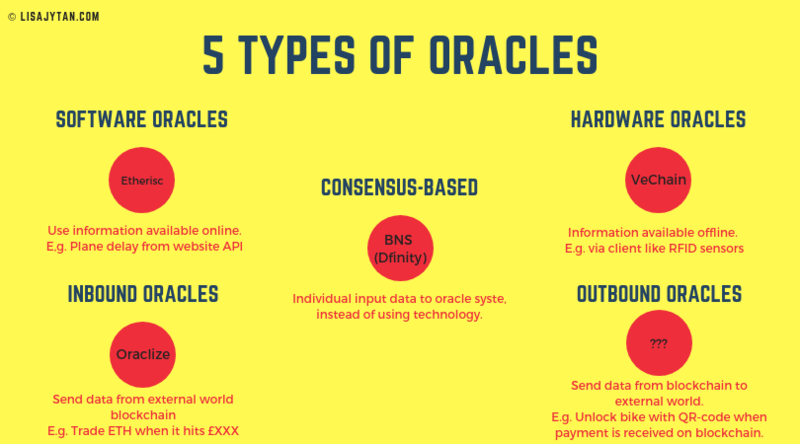 Oracles are useful to analyse things that happened off-chain, to coordinate with the on-chain smart contract. This is especially useful in prediction markets DApps. As mention in the voting mechanisms above, TCRs are decentralised list curated by people in the network. 15/11/2018 edit: Added an example of outbound oracle!